Nokia's new entry-level touchscreen smartphone showed off before it get official in leaked image, twitter's famous @evleaks tweets a shot of the Nokia Asha 502 shows attractive designed body in six different colors. The Nokia Asha 502 looks similar to Asha 500 and will runs on Asha series Operating System. According to Leaked image, The Asha 502 have a rear camera with support of LED flash, redesigned rear speaker, available in blue, green, red, yellow, white and black with a clear plastic casing surrounding the colored interior plastic. Nokia Asha 502 will have dual-SIM functionality and Wi-Fi connectivity. No words on display, camera pixels, internal storage and other phone specifications. Pre-installed Facebook app, Line app and Twitter app showed in leaked image. 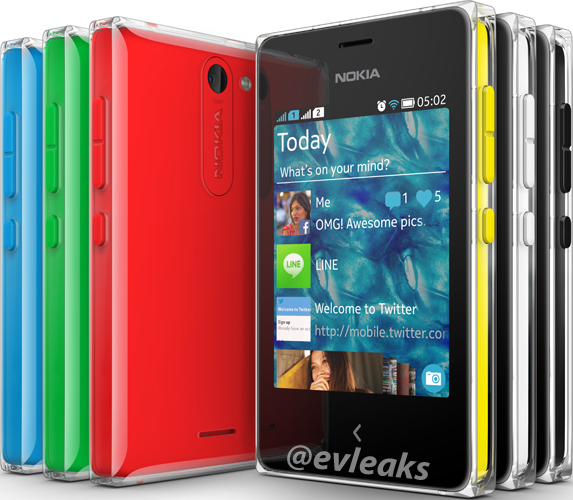 Nokia Asha 502 is expecting to go official next month, on October 22 at Nokia world in Abu Dhabi. The Nokia might unveil its Lumia 1520 phablet at the show.